Established in the year 1983, HK Malvi Industries is a leader in the market of manufacturing and supplying wide assortment of machines. 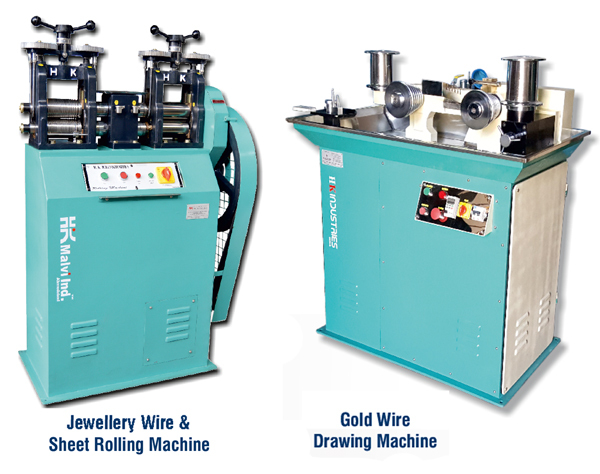 Our extended array of products comprises of Jewellery Making Machine & Induction Furnace, Gold Coin Bar Making Machine and Goldsmith Machinery For Wire Drawing. Our engineers utilise premium raw material and high-end technology for fabricating these machines, enabling us to meet demands of numerous sectors and industries. As an organization that prides itself on adhering to varied needs, we modify machines to suit specific requirements of customers. The continuous attempts of our highly experienced team have aided us to sustain a highly righteous track record. Moreover, we serve our clients by offering them precisely designed products manufactured with the use of modern manufacturing thus, making them durable, user-friendly and excellent in functionality. Our machines are quality checked strictly in tandem with parameters laid out as per clients need. Moreover, with the aid of skilled expertise and thorough quality management, we have attained a strong foothold in the domestic market.